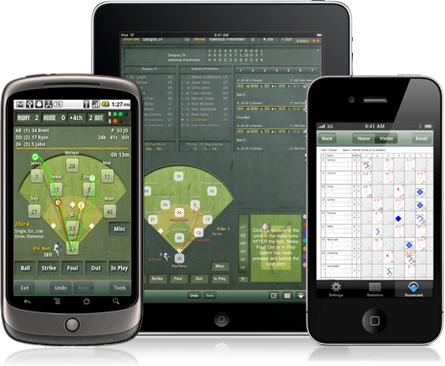 iScore Baseball is the easiest and most intuitive way to track a baseball (or softball) game. The flagship of the iScore Sports line of scorekeeping products, iScore Baseball allows coaches, parents and fans to keep a detailed record of the progress of a game. It has everything you need to score, track and review a game, and does not require you to buy any additional software or pay additional fees to access your statistics. We are impressed with the intuitive solution that iScore has brought to baseball charting. It allows us to compile a vast amount of information at our fingertips. iScore plays an important role in allowing us to better evaluate our players. You do not need to know how to keep a scorebook to use iScore Baseball, although scorekeepers will love the scorebook output. During the game, an intuitive interview process helps you to record even the most complex plays. Full base runner control means that every stolen base, pick-off and passed ball is tracked. Multilevel undo/redo support lets you return to any point in the game, from the first play of the game to the last. Rigorously tested to provide optimal input of all situations that occur during the game, iScore tracks pitch by pitch balls and strikes, balks, runners advancing by wild pitch, catcher interference, assigned errors and so much more. A pitch tracker allows you to track every pitch location, type and speed, and speckle charts let you review the pitch history. A batting spray chart and previous at bat summaries will give your team an edge over the competition. Over 500 Batting, Pitching and Fielding stats are tracked, and a detailed scorebook can be viewed at any time during the game. Cumulative statistics are also available for each team. In addition, all statistics and scorebooks can be emailed directly to any email address. Coaches will never again have to spend hours trying to extract data from paper records just to see how their players performed. Works great for scoring youth baseball, high school games, college games, and even professional games. Elevate your scorekeeping to the next level with iScore Baseball. Scorecasts can be viewed from any device by downloading the iScore Central app, or by going to iScore TV to find a live game or by going to http://iscorecast.com and typing in the scorekeeper's customer ID. You can email yourself a scorecard of any game you score with iScore Baseball. These scorecards are just like the ones kept with pencil and paper at youth sports games, and are an improvement in many ways. Features include full color representations of different types of plays, tracking how runners advance bases, strikes swinging vs looking, etc.